THIS PAGE WILL ALWAYS BE UNDER CONSTRUCTION PLEASE CHECK BACK OFTEN FOR NEW ADDITIONS There will be more information about Detrola history and even more pictures of their products here soon!! Please bookmark this page for future referenceThis material is copyrighted, if you wish to use any of the information or photos on this website please ask for permission. 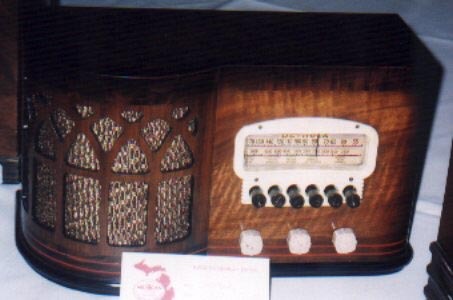 Detrola was the largest Michigan radio manufacturer, and was in business from 1931 until 1948. They grew from nothing to one of the largest radio manufacturers in just a few years time. They started out small, and had several locations before moving into a large factory building at the corner of Beard and Chatfield in Detroit. 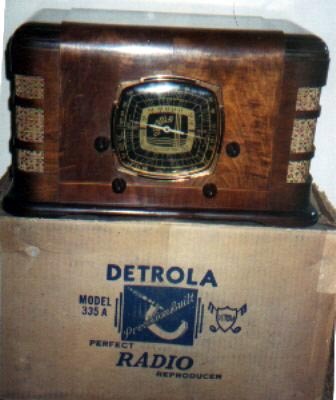 Detrola built radios under a variety of private brand names as well as under their own name. As much as 90% of production was private brand names. Detrola was a major supplier of radios for Western Auto, sold under the Truetone brand; and Sears & Roebuck, sold under the Silvertone brand. 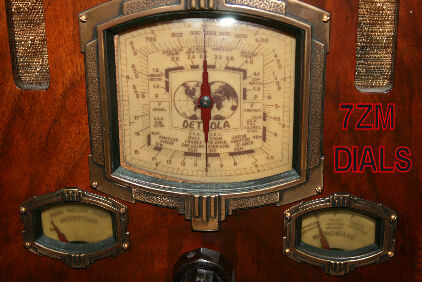 In the late 1930's, Detrola proclaimed in their advertising that they had the world's 6th largest output of radios. Many of the brand names they built were for regional or local stores and therefore had limited distribution as well as being very obscure. It is estimated that there are over 100 brand names that were built by Detrola, about 70 of these have been positively identified so far. 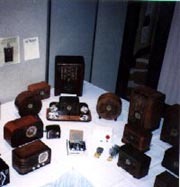 Detrola made lots of very ordinary radios, and also some highly desirable radios in the eyes of today's collectors. The tiny Detrola PeeWee and Super PeeWee took the marketplace by storm when they were introduced. There are also some very unusual designs, such as the 1936 round radio sometimes referred to as the "Wooden Bluebird" as is it an obvious copy of the famous mirrored Sparton; and the highly Deco 1936 Presentation Desk Set. During WWII Detrola merged with the International Machine Company, and they assembled military equipment. The new name of the company became International Detrola. After the war one of their models, the 571, had over 52 brand names and at least 10 cabinet styles for this one model!!! There are several photos of 571's and much information about them as well as other postwar models on the second page of this site. There is also more information about Detrola Electric Tuning, and Network dial closeups on page two. In the late 1940's they also assembled Ford car radios before stopping radio production entirely. VALUING COLLECTABLE RADIOS Many questions arise about "how much is my old radio worth...." or "what will it cost to repair...." and so on. With the majority of the old radio collecting hobby now on the internet, it has opened up a larger market of potential collectors than ever before. 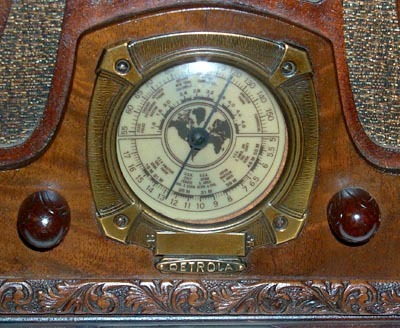 While there have been several old radio price guides published over the years, most of the values in them are quickly outdated and were never accurate for all regions of the country. Therefore it is difficult to put an absolute value on any particular radio. Condition is everything, and most people who are not actively involved in the radio collecting hobby are not even remotely qualified to appraise the value of a radio. 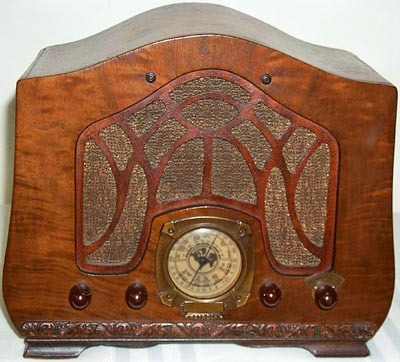 Antique dealers in particular almost always overvalue the radios they appraise, often by a factor of 5x to 10x what the radio would actually sell for at an antique radio show. 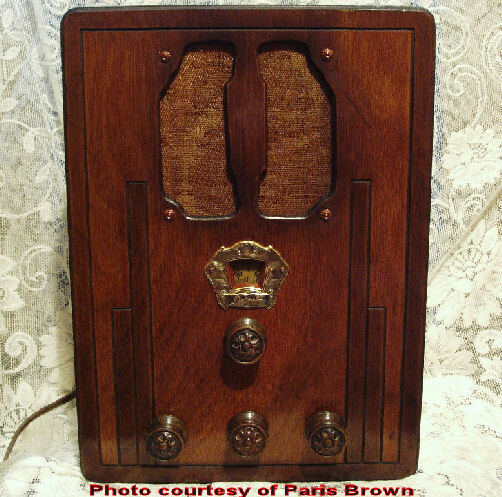 This has resulted in much disappointment among individuals trying to find a buyer for one or two older radios that they found in the attic or basement. 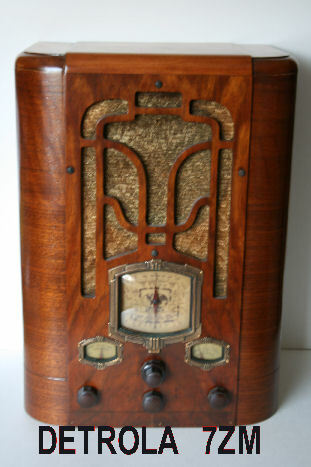 Most radio collectors are not interested in consoles except for very unusual ones, as they take up too much room and are very difficult to transport across the country. In many cases the cost of shipping is greater than the value of the radio. There are only a few radio collectors who are interested in radios that have a phonograph included. Collectors also do not want radios that have been refinished or "repaired" by unqualified amateurs. Even plugging in a 60 year old set for a minute to see if it works can be fatal. Irreparable damage can be done in only a few seconds, so it is always best to resist the urge to plug in that old radio you found up in the attic or at the flea market. There are a number of capacitors in every radio, and they fail with age as well as from use, they go bad even if the radio has not been used for a long time. For safety reasons as well as to prevent further damage to other components, these capacitors should be replaced BEFORE the set is turned on. Leave the testing/repair/restoration of the radio to a skilled person, preferably a professional technician with long experience in the repair of tube type equipment. There are many people across the US who are qualified to repair tube type radios. In many cases the cost of properly repairing an old radio will exceed the value of the set. Sometimes tubes and knobs are missing, but almost all tubes can be easily obtained for reasonable prices, and there are suppliers who specialize in knobs, even some who are making reproduction knobs. Most radios that have not been tampered with can be repaired to work again, but in many cases it is better to use the set for display purposes only rather than to try to make it functional again. 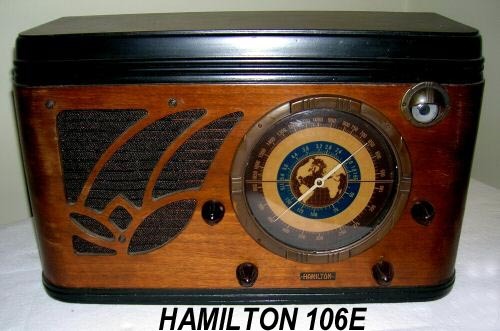 The great majority of older radios are valued in the under $100 range unless there is something very special or rare about them. Don't forget to visit page two of the OFFICIAL HOMEPAGE OF DETROLA RADIOS after you have seen the pictures below! You will find information on the PeeWee and Super PeeWee, the electric tuning models, the Network dials, and the postwar models on page two. The link to page two will be found further down this page. Mr.and Mrs. Detrola are really Dennis and Bonnie Smith. Detrola Jr. is our son Christopher. 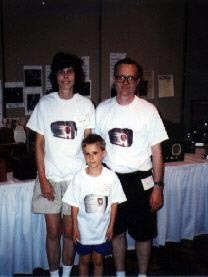 We got a lot of nice comments about the t-shirts we wore at the 1998 MARC Extravaganza, which were made for us by our friend Tammy Cavell. Chris thinks it is really cool that if someone searches on Google images for Detrola Jr, his picture above in the Detrola Jr. shirt will come up. I have been interested in the Detrola radio company since the late 1950's and have personally interviewed dozens of former employees. With help from family members, hundreds of hours of research have been done in an attempt to discover the history of this most unusual company. One of the former Detrola employees started calling me "Mr. Detrola" when I was about 9 or 10 years old because of my interest in the company and their products, and the name has stuck. I was very fortunate in locating a former Detrola manager who was with the company from almost the beginning until the last day, and also the woman who was in charge of the assembly line workers for a number of years. Their information cleared up a lot of questions about the actual design and manufacturing processes. 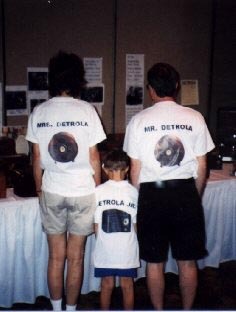 This family will always continue doing research on Detrola, so if you know of anyone still alive who worked there, or have any old documents related to the company, I would be most interested in the information. I am in the process of writing a book about the company and their products which should be completed in the very near future. Watch this website for further information. 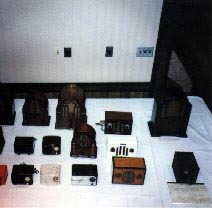 THE DETROLA DISPLAY AT THE MICHIGAN ANTIQUE RADIO CLUB (MARC) EXTRAVAGANZA, JULY 1998 The unusually shaped white radio on the left center row above is a Firestone 4A12, one of the last radios made by Detrola. The amber mirrored glass set in the center is most likely home made using the cabinet from a model 302 clock cathedral. The "Wooden Bluebird" model 105 and the Presentation Desk Set model 104 can be seen in the lower left photo, closeups of these sets are further down this page. 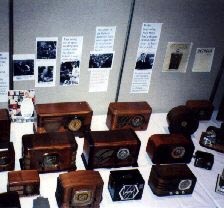 This is just part of the Michigan Manufactured radio display area at MARC Extravaganza July 1998 where members proudly showed their Detrola products. 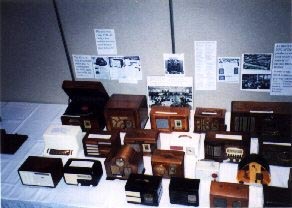 The Extravaganza is one of the largest and best shows for radio collectors, and is held every July in Lansing, MI. 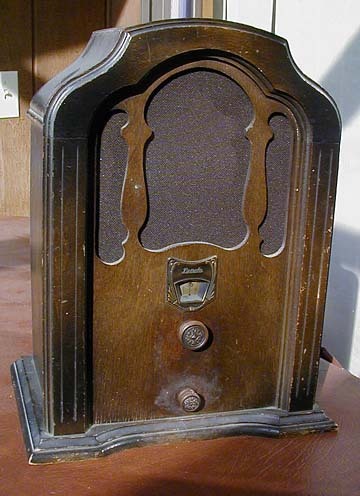 THE FIRST DETROLA RADIO This shouldered tall cathedral style radio is generally accepted by collectors as the first production Detrola model. 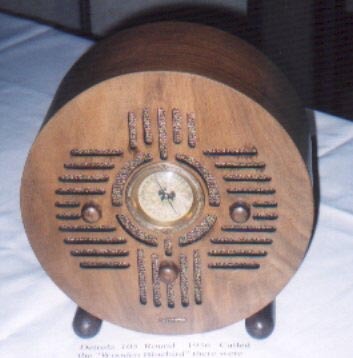 It is a basic 4-tube TRF transformer powered radio, and came out as a 1932 model. This model is easily identified by its unique cabinet design and the fact that there is no model number or ID tag on the chassis. The Detrola name appears only on the dial bezel. They did not start using ID tags on the chassis or assigning model numbers until several different models had been built. This example has had its grille cloth replaced but is otherwise original and has not been restored. It is unknown exactly how many of these were built, but it is one of the most commonly seen Detrola radios, and even though it was the first Detrola it is not rare or valuable because so many of them have survived. 1933 DETROLA TOMBSTONE This tombstone is a 1933 model, using a chassis which is a variation of the 1932 TRF model. It also has 4 tubes, a 57, 58, 47, and 80. The schematic of this model doesn't appear in Rider, but is very similar to the 1932 TRF. This set is among the first ones that had a patent plate on the chassis to ID the manufacturer and provide a serial number. If anyone has this model and the original paperwork is present giving the model name or model number and the schematic, a copy of that would be appreciated. 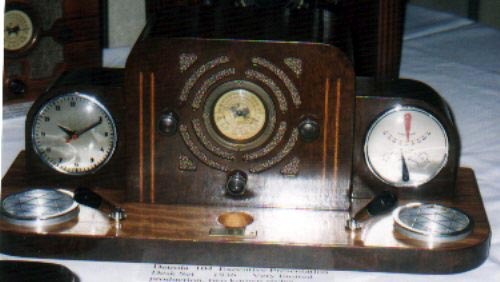 The identical radio also exists with only 3 knobs instead of 4, incorporating the on-off switch with the volume control rather than separately. THE 3-WINDOW MODELS There were several models in late 1935 which had 3 dial windows. In addition to the main tuning dial, there was a lower left window marked "Micro Tone" and the lower right window was "Micro Wave". These each had a small pointer and dial scale, for tone and band selection respectively. The chassis series were 6ZM, 7ZM, and 10ZM. Each was available in a table model tombstone style cabinet, as well as in a console cabinet. These sets had very ornate grilles. They used the brand new RCA all-metal tubes, which was unusual for Detrola as later sets still had mostly "ST" shaped large pin tubes. UNUSUAL 1935 MODEL This unusual and very stylish model appears to be a late 1935 model. None of the examples found have any model number on them. 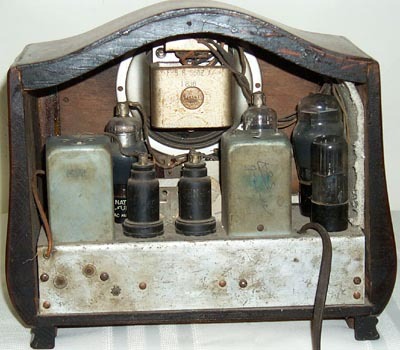 It is a 6 tube AC-DC chassis with at least two of the brand new RCA designed metal octal tubes (which didn't come into use until late 1935). No schematic appears in Rider matching the tube lineup, but it could possibly be a model 6X. It has a small world map dial scale similar to those used on other Detrola products around that time, and 4 knobs. THE DETROLA "WOODEN BLUEBIRD" model 105 A closeup view of the Detrola 105 "WOODEN BLUEBIRD"There is an original sales advertisement for the model 105 on page 2 of this site. 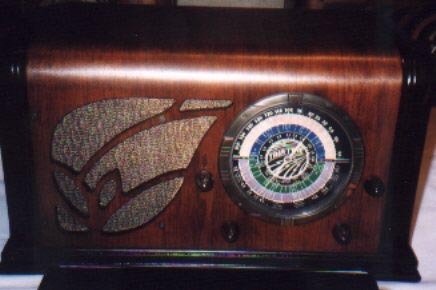 It's commonly called the "Wooden Bluebird" because the size and style of the radio are obviously influenced by the famous and rare Sparton mirrored radio. It is interesting that there are many more Sparton Bluebirds surviving than there are round Detrolas. This is a 1936 model. THE PRESENTATION DESK SET The Detrola model 104 "Presentation Desk Set" This 1936 radio also exists without the pen holders. A cigarette lighter belongs in the hole at the center of the base. Many of the existing Detrola Desk Sets have brass tags on the base indicating the name of the recipient and the company giving the award. Most of them are Chevrolet officials. This very nice 1936 set has a faded dial scale, common on Network Dial models which have been exposed to sunlight over the years. Note that the grillework is identical to the Truetone below even though the cabinet is totally different. 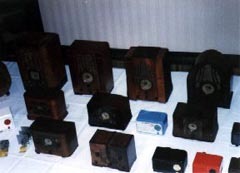 A Detrola 335A is shown here with its original shipping carton. This is a late 1940 model, but uses a cabinet style that was first seen a few years earlier with a different chassis in it. A few Detrola collectors that I know are always interested in unusual Detrola products, advertising, promotional items, etc. Please e-mail complete description including brand name and model number of any Detrola products you are interested in selling, or if you are inquiring about products manufactured by Detrola prior to 1948. Click on the link here to e-mail us. PLEASE NOTE THAT THIS IS AN ANTIQUE RADIO WEBSITE. WE HAVE NOTHING to do with the imported products being sold over the internet and at K-Mart such as reproduction antique phones and radios. Please contact your original retailer because we cannot help you find parts or service for those products. Entire contents of this website and this page Copyright © 1998-2014 with all rights reserved.If you wish to use any of the material contained on this website you must first obtain permission, please email using the link above.